Soil: Well drained soil. Excellent drainage is a must for peak performance. Bloom Time and Color: Showy flowers in shades of pink to deep red in summer and last for weeks. 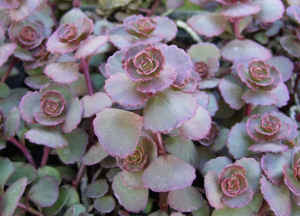 Description: This species of Sedum is tough and curiously decorative when used as a ground cover or in rock gardens. Hardy perennial. Will trail over the sides of containers for a good accent. Very drought tolerant. Care: Extremely easy to grow and maintain. Clumps may be divided and replanted anytime during the growing season.